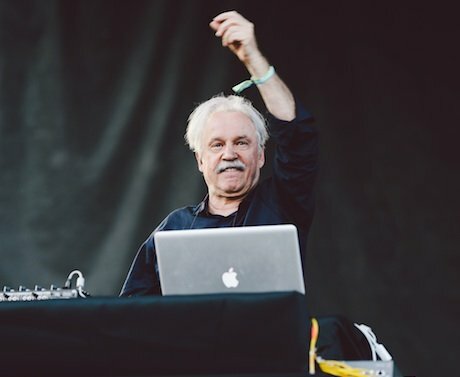 "Hello Chee-cahgo," said Giorgio Moroder, hard "ch" sound and all, as he took the Red Stage at dusk. "My name is Giovanni Giorgio, but you can call me Giorgio." He began his DJ set with a too-quiet "Love to Love You Baby," but as the bass of the remix dropped, the volume turned up and the crowd did too, waving an arm each in unison to the tune as Moroder beckoned them. At 74, the Italian legend is cute as hell, grinning profusely and pre-emptively disarming the crowd with clapping and finger guns lest anyone feel they were too cool to dance along. He spent "From Here to Eternity" orchestrating the crowd, anticipating drops in the new mixes so they could experience each moment together. It was a formidable hit list: "Take My Breath Away" (from Top Gun and Donna Summer's "Hot Stuff" to start, but Flashdance's "What a Feeling" and his iconic "The Chase" really got things going. When he started sliding his newer remixes in — of Calvin Harris' "When I Met You in the Summer" and Iggy Azalea's "Fancy" — the dance party hit a climax that didn't let up through Summer's ""Bad Girls," his newest tune "Giorgio's Theme" or "I Feel Love." Then, the music stopped. Shouted Giorgio, "This is, by far, the best gig of my life! Two years ago the robots called me..." he began, telling the Daft Punk story that has led to a career renaissance and renewed appreciation for his craft. "I said, 'Let's put down a click!" he yelled, and in swept a sped-up "Giorgio By Moroder." With a song to go, Moroder played Blondie's "Call Me," a reminder of just how many hits the producer has had a hand in over the years. Remember the name.